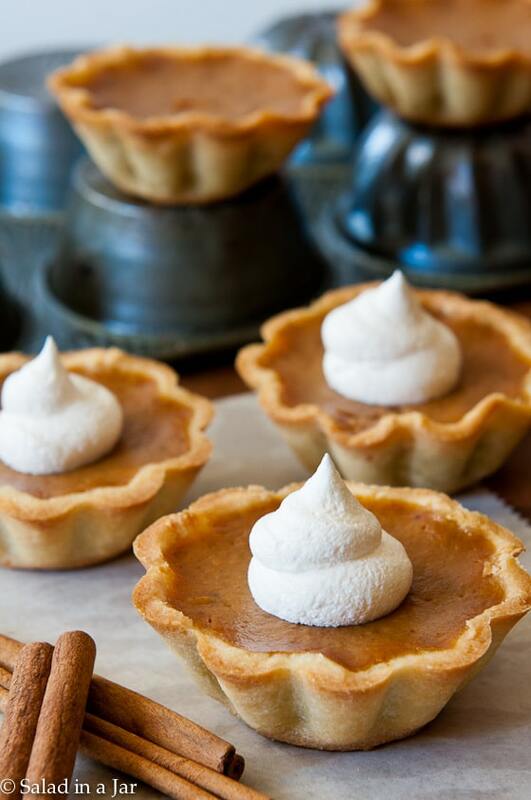 Pumpkin Pie Mini-Tarts - Start a new holiday tradition that's sure to be a hit! 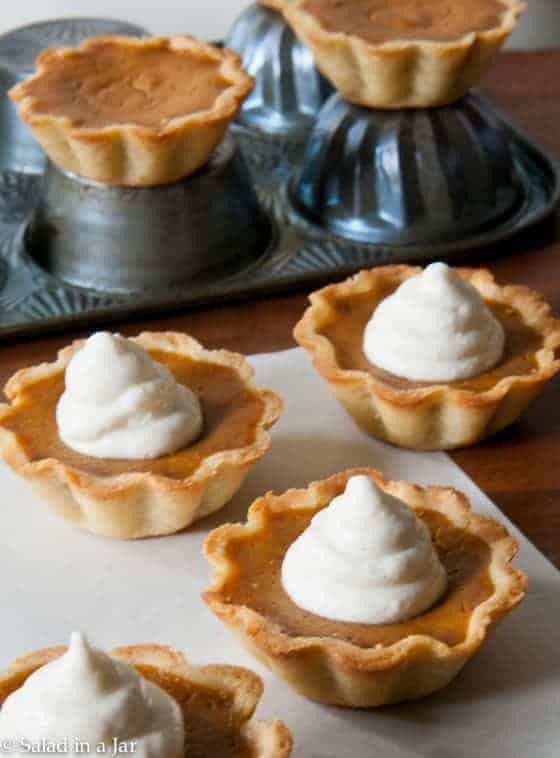 Pumpkin Pie Mini-Tarts are miniature pumpkin pies in a homemade cookie crust. These tarts are perfect for parties, receptions and family dinners where people want to try lots of desserts and prefer smaller portions. Think of these mini-tarts as the “100-calorie snack” edition of the traditional Thanksgiving pumpkin pie. I’m not saying each tart is only 100 calories. I don’t calculate calories on desserts. However, they are a lot less than an eighth of a piece of a regular 9-inch pumpkin pie since I can get 15-16 tarts out of the same ingredients with some filling left over. The pie filling is my adaptation of the Libby’s recipe on the back of the pumpkin can. The crust is the same as seen in my Fruit and Cream Tarts and Chocolate Ganache Tarts. If you are an amateur cook, the crusts are a bit tricky at first. PLEASE, PLEASE practice making them at least once before the big day. 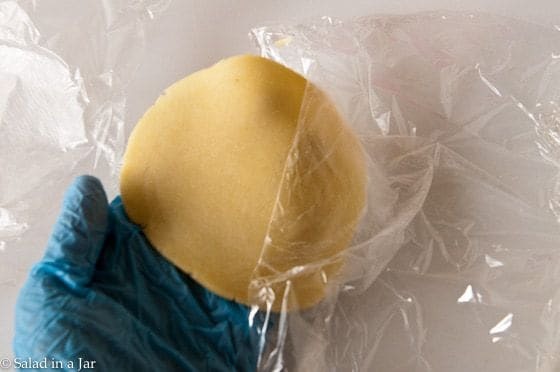 It’s basically a molded shortbread cookie. If creating your own crusts scares you, just buy mini-tart shells from the the grocery store. They may not be as fresh as homemade, but they will be beautiful. 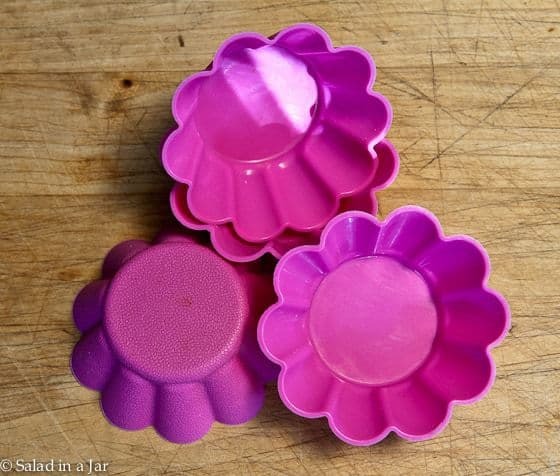 I highly recommend these silicone molds for making mini-tarts. Nothing sticks to them, making it extremely easy to extricate the baked tart from the mold. I prefer the flower shapes over the cupcake-liner look. 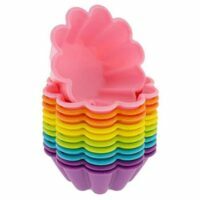 These are also great for regular cupcakes, individual brownies, cornbread, etc. 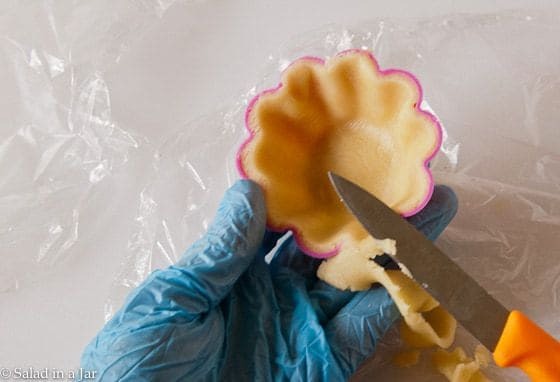 If you don’t want to buy silicone cups, you could use a cupcake pan, but it’s a lot more trouble since you can’t work with each tart cup individually. I hope the following tutorial will give you some confidence, but honestly, nothing substitutes for practice. Form dough into a cylinder. Slice roll into 15-16 equally-sized discs. Lay one slice in the middle of a piece of plastic wrap. Cover with another piece of plastic wrap. 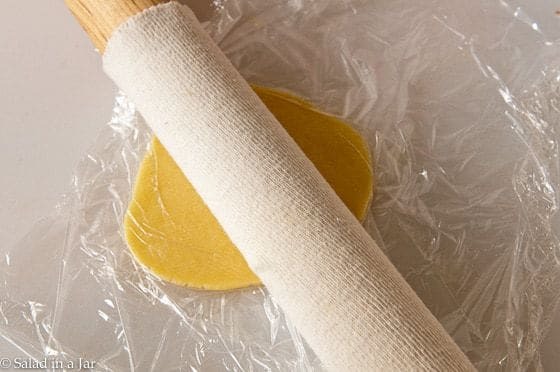 Use a rolling pin to flatten dough until the circumference is about 1/2 to 3/4 inch greater than the circumference of your tart cup. Lay the tart cup upside down on top of it to check. Peel plastic wrap off of the top. 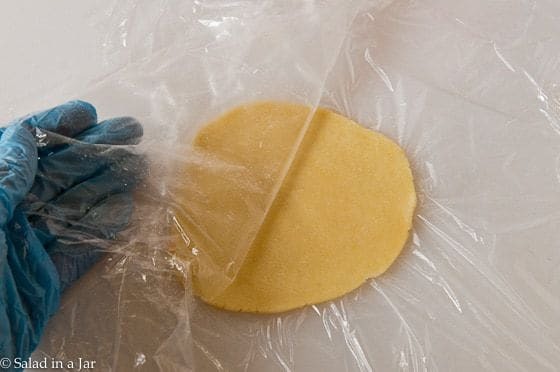 Flip flattened disc and remove the remaining layer of plastic wrap. 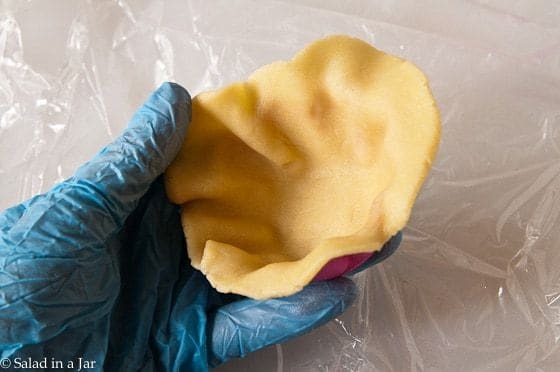 Press dough into tart cup with your fingers. If it tears, squish it back together. 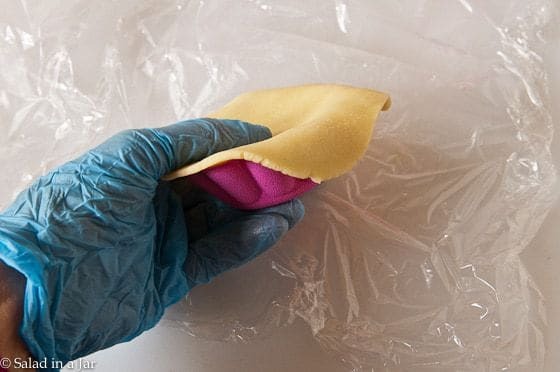 If it pleats, use your fingers to press the excess dough down smooth. The goal is uniform thickness throughout so it will bake evenly. Trim crust with a sharp knife to make a smooth edge. Place finished cup in the freezer until hard. 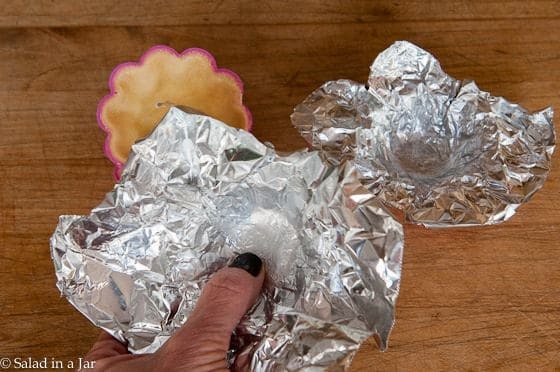 To keep crust from bubbling up in the middle, cut aluminum foil into small squares. Non-stick foil is best. Use fingers to mold foil to inside of tart making sure the top edge is also covered to prevent over-browning. How many tarts you get out of this recipe will depend on the size of your tart cups. I can get 15-16 out of this recipe with some filling to spare. I bake the leftover filling in a small glass dish and add it to yogurt. YUM! These Pumpkin Pie Mini-Tarts are easy to carry to Grandma's house or put them on your dessert buffet. The small size makes them easy to grab and eat. 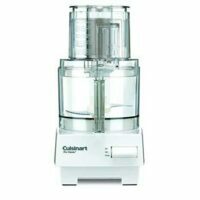 Combine flour, sugar, and salt in food processor. Cut butter into 8 slices and add to flour, pulsing several times until mixture resembles oatmeal. Add egg yolk mixed with cream. Pulse until all ingredients are moistened. Then allow machine to run a few seconds until dough starts to stick together. (Add additional drops of cream if dough seems too dry.) Press dough into a roll like refrigerated cookie dough. Wrap in plastic and chill 30 minutes. Spray molds generously with Baker's Secret or something like it. 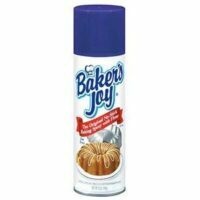 (Baker's Secret is an aerosol spray that mixes flour and oil.) 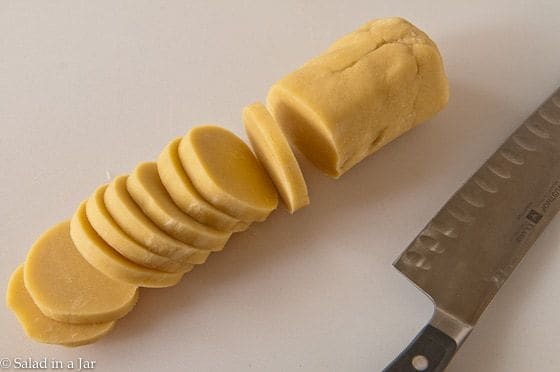 If using silicone molds, no greasing is necessary. Slice roll of dough into 15-16 pieces. Using a rolling pin, flatten dough between two pieces of plastic wrap into a circle slightly larger than tart molds. 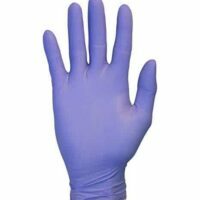 Press into mold with fingers, being careful to keep thickness consistent. Use a knife to trim off any extra at the top. I usually have enough scraps to make another tart or two. Freeze for at least 30 minutes, overnight, or up to a month. 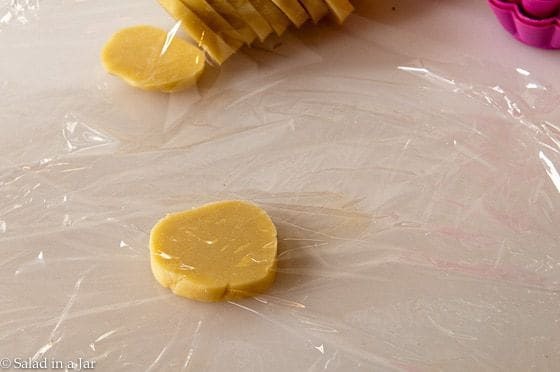 Place frozen tart shells onto a cookie sheet and press a small square of foil down into each crust that molds to shape of crust and covers the edge. Bake at 400 degrees for 10 minutes. While crusts are pre-baking, combine first 6 ingredients in medium bowl. Whisk eggs and pumpkin together in another bowl. Add spice mixture and whisk well. Add cream and milk and whisk until smooth. Optional: Pour pie filling through a medium sieve for maximum smoothness. Fill each pre-baked tart taking care to put as much filling into each tart as possible without pouring in too much and making a mess. Bake in 350-degree oven for 15-20 minutes (depending on the size of your tarts) or until filling is set. Allow to cool on a rack. Chill before serving. If using a muffin pan for tarts, I found you don't need to pre-bake the crust--especially if the pan has a dark coating. Pour filling into frozen crusts and bake for 20 minutes or until filling is set. It worked fabulously! i just switched out the cloves for mace and it was delish! Thank you for the recipe and your reply! I tried making these with silicone molds and they completely stuck. Waste of time and ingredients. If we are going to bake at the same day or time, do we have to freeze it before baking? Or, should be freeze for 30 míns before pre baking? Yes. Freezing keeps them from shrinking too much. I have not tried freezing these but I’m skeptical. 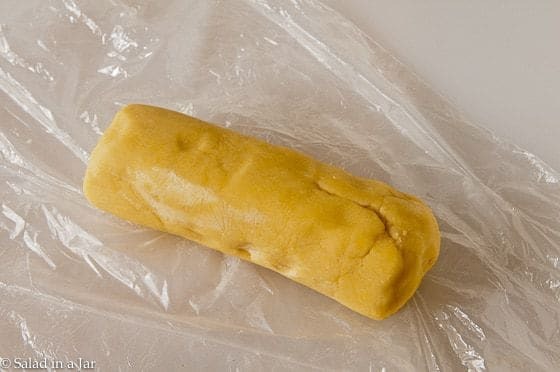 Cooked custard filling of any kind tends to separate when frozen. You can freeze the unbaked crusts ahead of time for sure but once you put the filling in and bake them, you have about a day to eat them. I could eat half a dozen of these right now. Not because I’m hungry but because they look delicious. Best wishes for a wonderful Thanksgiving Paula. I absolutely love these tarts. What’s better than a pumpkin pie you can walk around with? nothing. SO much better than a big pie. I would imagine these are a lot easier to eat and therefore MIGHT just mean eating MORE!! Just sayin’. Yes, I have had people tell me that as they grabbed “another for the road.” Be warned! Sounds about right, Susie. Thanks for figuring it out. Paula, these look wonderful, what a great idea and well done tutorial. I’d eat too many thinking they were “safely small”.